In an article to appear in the academic periodical Journal of Archaeological Science Chilean chemists report their investigation into the consumption of plant-derived hallucinogenic substances through smoking and snuffing in prehispanic indigenous cultures in Chile. 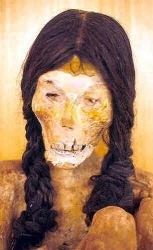 The search for substances was conducted via hair anlaysis of mummies from the Atacama desert in northern Chile (c. 100 B.C. – 1450 AD). Postdoctoral scientist at Universidad de Chile and lead author of the article, Dr Javier Echeverría explains the significance of the findings. As part of a larger multidisciplinary team, Drs Echeverría and Niemeyer are pursuing a line of investigation in Archaeological Chemistry. By way of introduction it is very interesting to allude to this coincidence: The open skies of the Atacama Desert allow astronomers from around the world to gather to observe the stars and thus unravel the origin of the universe. Meanwhile, other scientists look to the ground; due to the extreme dryness of the desert soil mummified human remains are preserved intact guarding valuable information about our ancestors. Coincidence or not, these ideal environmental conditions are conducive to the making of a retrospective window, which allows us to form a relationship between the ancient past of the mummies and the past of millions of light years of our universe. A mistake that is often often made is to think that the mummies of San Pedro de Atacama (SPA) were subjected to artificial mummification process as was the case with the mummies of ancient Egypt. In fact, the process of SPA mummification occurred in quite a natural way, due to the extreme aridity and soil salinity in the Atacama desert, and high temperatures in the area. After this clarification, we can say that all the ancient inhabitants of SPA were mummified. 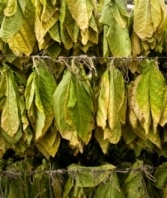 The use of nicotine-rich natural sources, mainly species ofNicotiana (Tobacco), have been reported for the large majority of the pre-Columbian American cultures since prehistoric times. The use of tobacco by ancestral Amerindian cultures is deeply rooted in their culture and thinking, functioning as a source of psychotropic substances used for magico-religious ceremonies, medicinal and healing practices, and recreational purposes. Tobacco is thought to have originated on the lower slopes of the central Andes and the South and was spread throughout America. It is important to note that the first Amerindian settlements coincide with the place of origin for wild species of the genus Nicotiana, and prehistoric interest for this plant is based exclusively on its main alkaloid, nicotine. Among the species with high nicotine content are N. rustica andN. tabacum, coincidentally the most predominant species on the continent. There are reasons to believe that the cultivation of tobacco for religious and healing purposes, including its use for shamanic trance, started at the same time as agriculture emerged in South America. Another interesting fact is that wild species of tobacco grow naturally on land that has been disturbed, such as trails, roads and also on land used as burial sites. Perhaps for the latter reason it was thought of as a gift from the spiritual world to the descendants of the people buried. Particularly in Andean cultures, the use of psychotropic substances was principally used in ceremonies and rites of a collective and social nature, for example the ceremony of Pachamama, where tobacco was the nexus between human beings and the spirit world, and was used as an offering to Mother Earth. It was also used, with the participation of the shaman, in curative medicinal therapies. It should be pointed out that there is a close functional relationship between tobacco and shamanism, because ritual tobacco use places the shaman as the central figure, seeking access, through acute nicotine intoxication, to altered states of consciousness and contact with the spirits and the supernatural.In this way, more than the frequency and form of administration, the importance focused on high doses causing intoxication. The dosage used depended on the type of effect that one wished to achieve: low dose nicotine has a sedative effect, while at high doses it has a narcotic and hallucinogenic effect. Thus with varying dosages, one can modulate the effects on the organism. There is archaeological information on the use of other psychoactive substances in the area of northern Chile. They have found seeds in some of the tombs in San Pedro de Atacama of a plant species that does not grow in Chile called cebil (Anadenanthera colubrina). Also plant species of wild tobacco and cebil remains have been found in pipes from the Northwest of Argentina. In this way our efforts focused on analysing the major alkaloids and their derivatives of these two types of natural sources; 5-OH-DMT, DMT, 5-MeO-DMT on the one hand, and nicotine and its metabolic derivatives on the other. Recently, we have published a review of the alkaloids of the native flora of Chile, where we found that only 29 percent of the species potentially rich in alkaloids have been studied. This gives an idea of the enormous phytochemical work pending in Chile, particularly in the flora of the northern part of our country. With respect to whether it’s known that local plant sources were used for psychoactive purposes, there is a branch of archaeology called archaeobotany, studying the micro-remains of plants found in residues of archaeological artefacts allowing the identification of the species to which they correspond. Our group will soon begin work on chemical and archaeobotanical analysis of residues from archaeological pipes found in the area with the aim of discovering what plant source was being used for these purposes, which will complement the information obtained from the hair analysis. With particular reference to the consumption of nicotine, we analysed the paraphernalia associated with the tombs where they mummies were found and assign an index, which we call a diversity index, which is a proxy for the wealth of the grave and therefore the social status of the individual. In this case the results indicated that the consumption of nicotine was independent of the social status of those who consumed it. Chewing coca leaves is still an integral practice of many of the Andean peoples. This ritual has a sacred and ceremonial nature associated with its medicinal properties as an analgesic, rather than its use as a narcotic. The ancient use of coca leaf contrasts with the current use of its major alkaloid, cocaine, by contemporary societies, which considers it a stimulant drug of the central nervous system. My feeling is that the consumption of nicotine did not cause major changes in public health in prehispanic times although it is unknown if these people suffered from illnesses associated with the consumption of nicotine, for example with lung cancer, emphysema or other pulmonary or cardiovascular pathologies. Life expectancy at that time was much lower than today and so probably these pathologies were not in evidence [by the time of death]. I think that it is an interesting topic to address in the future. This research began as a multidisciplinary project that sought to study the interactions and human mobility among prehispanic populations of the north and centre of Chile, using biomedical, genetic, chemical, and mineralogical markers. Within the chemical markers it was envisaged to analyse bioanthropological remains, particularly hair of the mummies, and archaeological remains such as residues from pipes and ‘tablets’ for the inhalation of hallucinogens. I am currently developing a postdoctoral project funded by FONDECYT that seeks to explore the psychoactive potential of the flora of northern Chile and their potential use by prehistoric peoples. Echeverría, J., Niemeyer, H.M., Nicotine in the hair of mummies from San Pedro de Atacama (Northern Chile), Journal of Archaeological Science (2013), doi: 10.1016/j.jas.2013.04.030.